Day Two began late as we lazily woke up without the usual urgency of a routine day at home. No doorbells, no phones and no maids clanging pots and pans in the kitchen. Just the chirp, chirp of birds on the lagoon outside and the hum of the AC indoors. Paradise! After our morning tea at the bedside, we got dressed for breakfast. The buffet breakfast at The Cafe wasn’t as elaborate as I have seen in other 5-star resorts of Goa. Food items included Indian and Western staple. There was a live station making uttapams and dosas, while another one made eggs to order. They had wadas with sambhar, parathas, waffles, baked potatoes and few other sides along with fresh fruit, yogurt, cereal, juices and cheese. An hour later we at the beach once more. It was still early in the day, the breeze was cool, and we were enjoying the tranquil morning filled with the roar of the ocean punctuated only by the excited squeals from our little girl whenever a wave washed over her feet. She and her mom went hunting for sea-shells and by the time they had their hands (and pockets) full, the sun was getting warm and we headed back to our room. The buffet lunch wasn’t anything to write about. 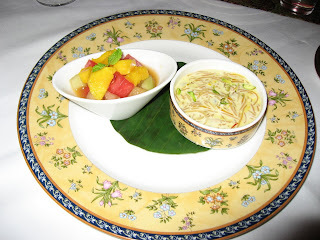 A variety of Indian, Italian and Chinese items that tasted good, but mostly simple fare. Thankfully, I had chosen to take meal credits rather than a package that limited me to only the buffet meal. I made a note to try other restaurants during the rest of our stay here. We spent the afternoon in the swimming pool and sipping tropical cocktails from the Poolside Bar. The swimming pool is good but unremarkable (when compared to the Park Hyatt or the Radisson White Sands in Goa). In any case, we spent the greater part of the day splashing around until it got close to sunset. Then we returned to the beach to see the breath-taking picture of the evening sun setting over the red-orange Arabian Sea as flocks of birds on the horizon headed home. We stayed back until dark and then returned to Susegado for some more seafood and wine. Our daughter was well asleep by the time we decided to head back; the wait-staff had already called one of those electric golf-carts to drive us back to the room. Day Three was the day of the Spa. 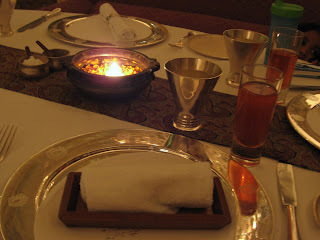 After my experience at the Leela, Bangalore, I was hooked on the Shirodhara+Abhyanga package which I repeated here. The masseur was well trained and the 90 minute massage lived up to my expectation. The little one wanted to watch a movie on DVD, so we spent the afternoon within our room. We were glad we had packed more clothes than we usually do. Due to the humid weather, wet clothes took forever to dry here, even within the air-conditioned room. 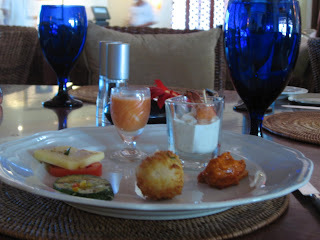 In the evening, we decided to eat at Leela’s signature Jamavar restaurant. They had a special Kerala fixed menu on this day. The starters of Lamb Stew with appam bread was the best part of the menu! That was followed by Tiger Prawns Korma, South Indian Spiced Potatoes and Ghee Rice. Dessert was Vermicelli Payasam and Fresh Fruits. All through our dinner, we were regaled by a live jugalbandi of santoor and tabla. In my opinion, the Jamavar, and Leela in general, doesn't score very high on food. And I make this comment having tried both their Bangalore and (now) Goa hotels. 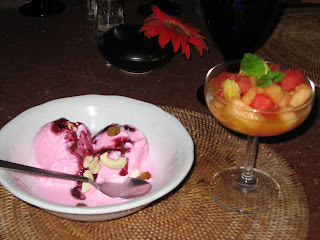 There was a time when I loved the buffet dinners at the Leela in Mumbai, but they certainly are no longer in the same category as the Taj or the Sheraton any longer. 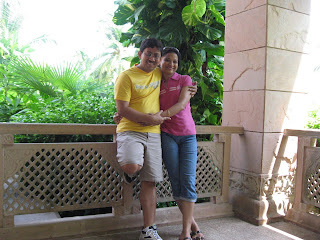 My husband and I went to Goa for our honeymoon and stayed at Heritage Village Club on Arrosim beach. 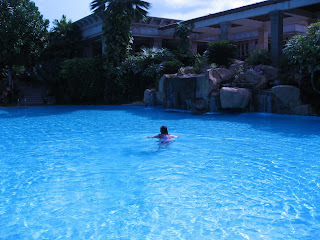 I loved the resort. Great atmosphere, great food, excellent beach (there were roughly a dozen people in peak season), and unbeatable prices. I like buffets. Not to stuff myself, but to sample different kind of food. I then make a note of my favorite. 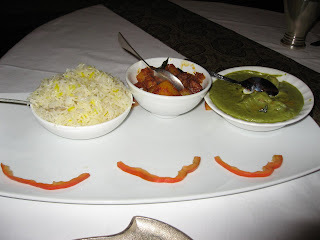 This is how I discovered and got familiar with Indian food! 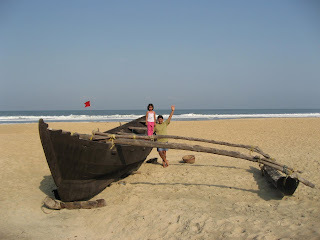 Oh Goa. 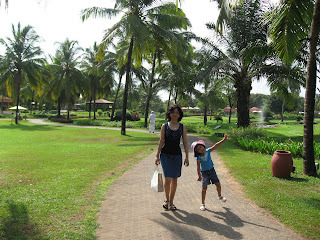 I recalled my post-Christmas season trip with family less than 6 months back. 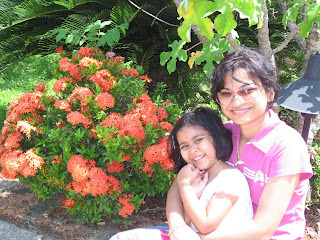 @swati: Thanks for sharing your experience. @zhu: Yes, I do too. The downside is you don't figure out what you are eating sometimes since you tend to heap multiple things on your plate. What a great trip to a lovely place - very exotic to a Norwegian you know! It looks nice, warm and wooooow all that good food - my mouth is watering - thanks so much for sharing and with all the good pics too! @rennyba: Thank you, my friend! You need to plan a trip to this part of the world some time. Thanks for stopping by! and for leaving a comment. @joanne: Hope to see you back here too! 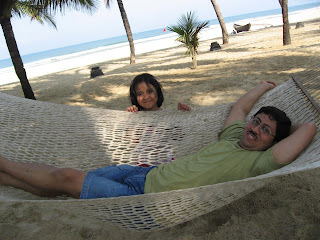 I am looking for a honeymoon destination in Goa to spend 3 days and am having a tough time figuring out where to stay. Your post sheds detailed light on Leela and is well written. @sulabh: Thank you! Glad you found it informative.